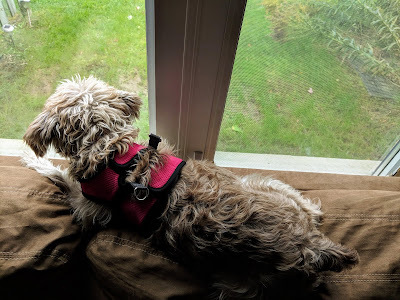 Calli often sits on top of the sofa and scans the backyard for squirrels, rabbits, birds, and any other animal she deems not worthy of being anywhere near our home. Bad dog owner that I am, instead of training her out of this obviously suboptimal behavior, I reach for a camera. See, she's a Miniature Schnauzer, which means she's made of some pretty strong, stout, stubborn stuff. We've trained ourselves to train her way beyond what we ever thought possible, thanks largely to the fact that she's a smart, aware and incredibly sweet and sassy puppy. We hit the jackpot with her, but we also recognize some things may never change. Like the wild barking whenever she sees animals and people for the first time, and the hours of sentinel-like positioning over the top of the couch as she seeks out new friends to, ah, play with. And I'm perfectly okay with that. Because while I've hovered closely over her since the moment we first brought her home, I've been watching her especially closely these past few weeks. Years ago, a friend of mine, in the middle of sitting shiva for a close family member, described her dog as carrying a lot on his shoulders. It's been years since that conversation, but that phrase has stuck with me ever since, because as I've watched our own barely-15-pound furry being these past few weeks, I've realized she indeed is carrying a lot on her seemingly tiny shoulders. She's always been a cuddly girl, but now she lingers longer, plays a little harder, lets us nag her a bit more before she decides she's had enough, if she ever decides at all. She knows something's changed, that her humans need her to step it up a little. And she absolutely has. Given how unbelievably good she's been as we've rolled with the punches of late, I was perfectly content to let her hang out on top of the couch as long as she wanted. Thanks to those giant shoulders of hers, she clearly earned it, and then some.